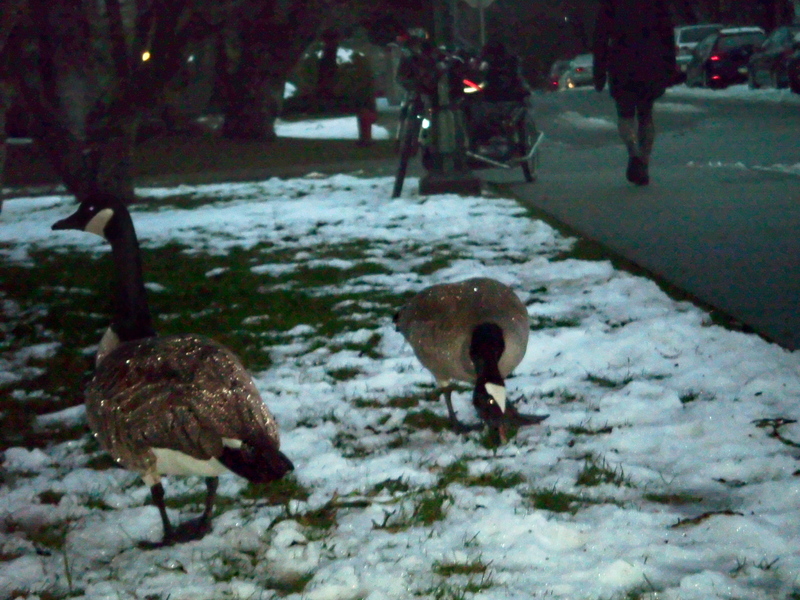 Canada geese preserving lawn order amid the winter chaos, in the 1200 block of 11th Avenue, late Friday afternoon. I’m glad they’re back but I wonder how all the Canada geese who returned—amid much honking—to Vancouver’s Fairview neighbourhood in early January feel. They must be kicking themselves for jumping the gun. They’re not snow geese after all! Despite the early signs of spring being snowed under, the geese are managing. However, on Friday (February 15th) I found a pair of them languidly cropping the exposed patches of an otherwise snow-covered lawn fronting an apartment building in the 1200 block of 11th Avenue. And I have to say that they didn’t look the least bit put out as they pecked and waded through the few centimetres of sudden winter snow that was covering any signs of an early spring, which may have drawn them back to the area. 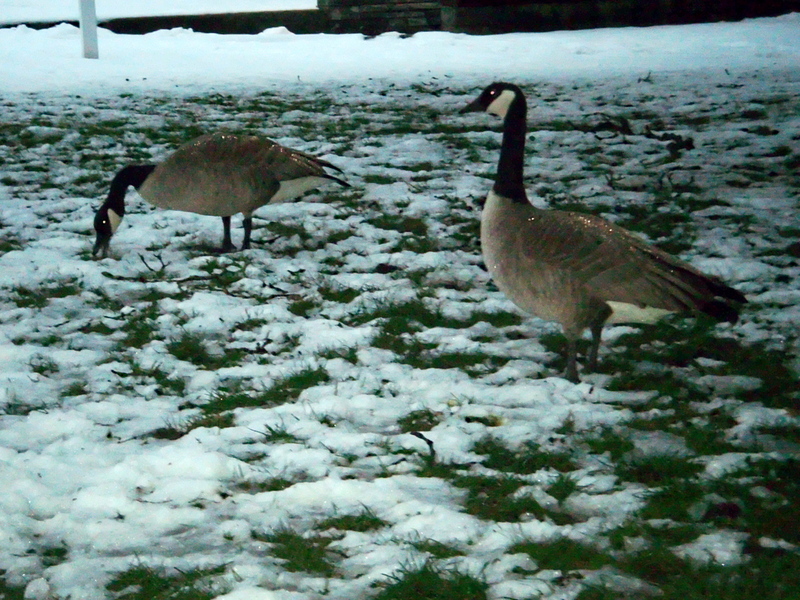 I should have remembered that Canada geese, if not entirely unflappable, are not the sort of bird to get their feathers ruffled over a little bit of snow. 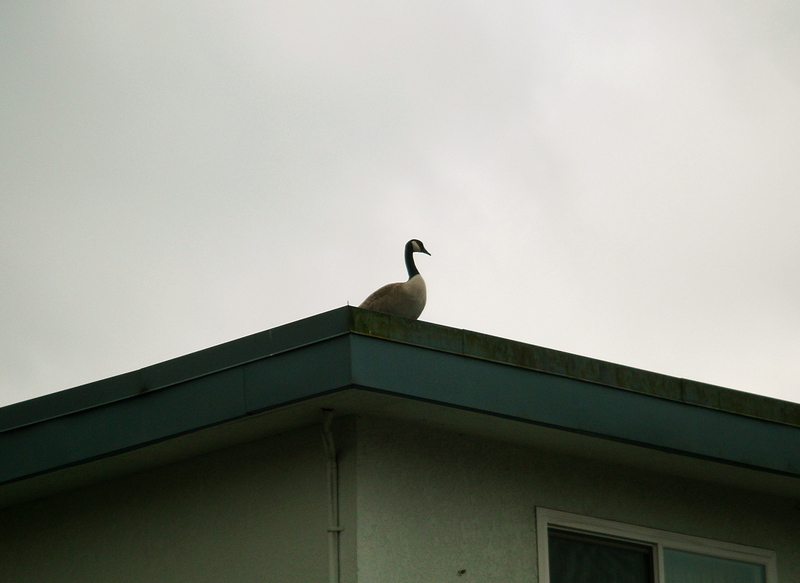 One of two Canada geese seen atop a 10th Avenue apartment building on the morning of January 27th. Although I had been seeing and hearing Canada geese in the Fairview neighbourhood since the beginning of January, my first chance to actually photograph some did not occur until the last week of the month, on the 27th. This was in an the alley of the 1300 block, on the south side of West Broadway Avenue. The pair seen January 28th in the alley of the 1300 block, off West Broadway. 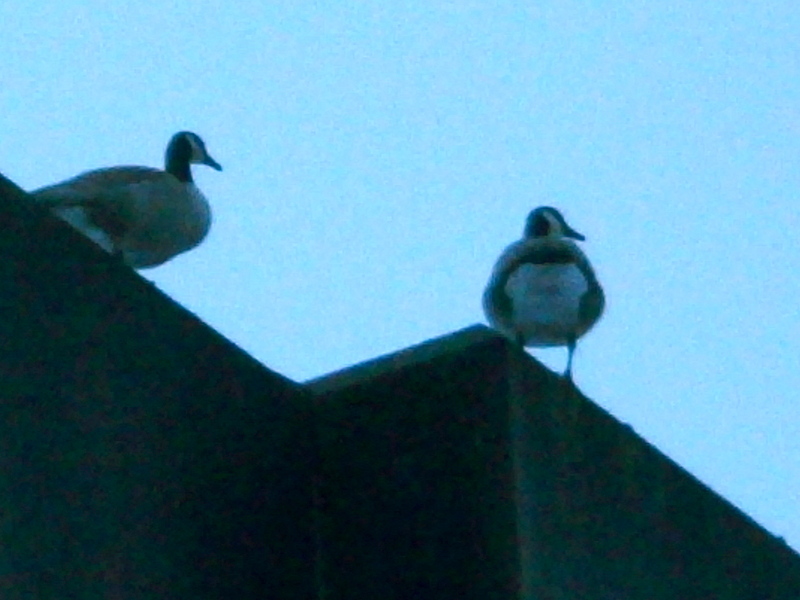 The Canada geese I snapped that January morning, perching in their stately way atop a three-storey walk-up, may have been the same couple that I saw yesterday, on Friday afternoon. And the two seen on the morning of February 15th, in the 1400 block of West Broadway. They may also have been the same ones that I saw January 28th, in the alley of the 1300 block off West Broadway and on Friday morning atop a building in the 1400 block of West Broadway. For all that I adore them, I know relatively little about Canada geese. I have read that they mate for life and in my experience they are rarely seen except in pairs. They appear to be extremely territorial and they evidently share my fondness for the Fairview neighbourhood. Like so many others, Canada geese apparently come here for the grass. Every single one of them looks identical to every other single one of them! The only reason I do not believe that all the pairs of Canada geese I am seeing—throughout Fairview—are just the same two birds is because I watched several skeins of them flying back into the neighbourhood in early January. And because of the other thing I know with certainty—they are just too lazy to do that much running back and forth. Note: they are only referred to as skeins in the air. 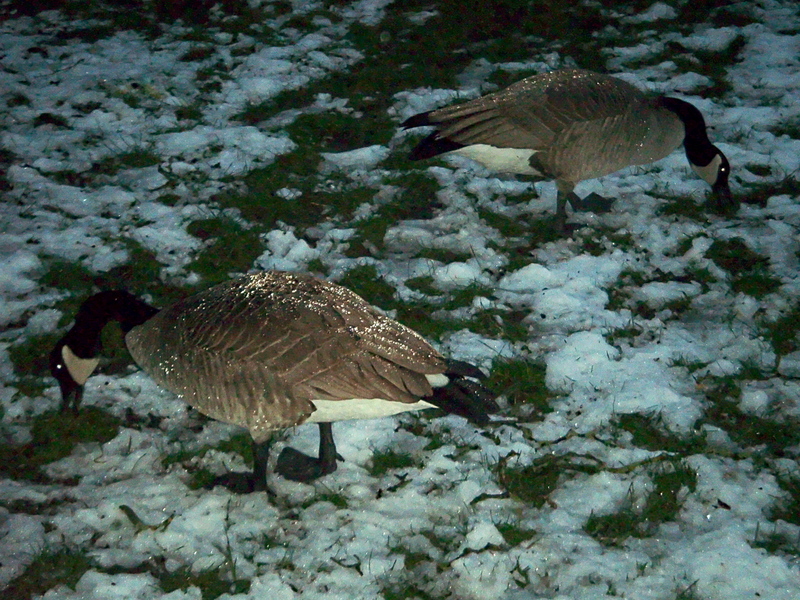 On the ground, a group of Canada geese should be called a federation. Trust me on this and feel free to tell all of your friends. Our home and native geese! True geese love in all of us command. The True Geese strong and free! 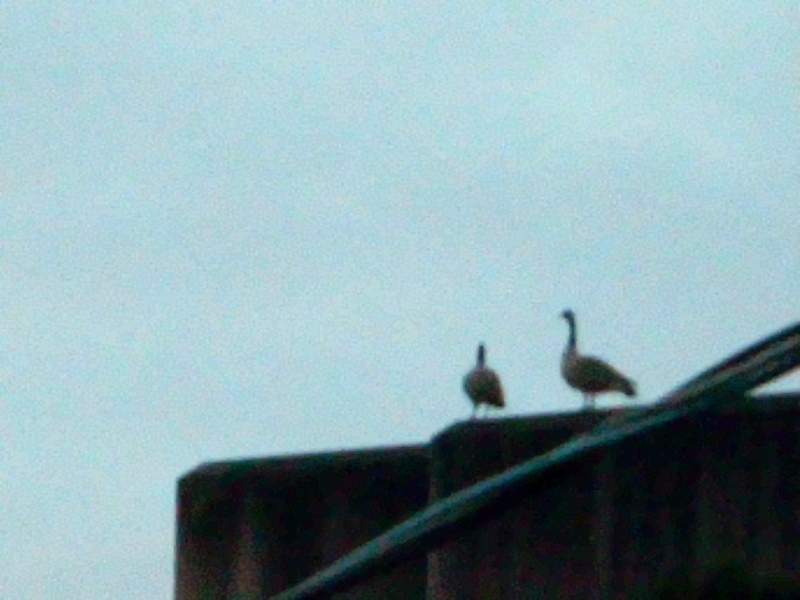 O Canada geese, we stand on guard for thee. And don’t forget to sign the petition on your way out to include them on the obverse of the Canadian hundred dollar bill. Click the geese to enlarge them. Good morning, Ive stumbled upon your site and will likely spend the rest of the day reading your posts. I was trying to research the owner of Erkindale apts in the West End in the 60s70s and maybe the 80s. I was researching the demise of the West Ender newspaper and Mckeown led to your blog post where you said one of your earliest illustrating jobs was to draw homes prior to their destruction. I was born in the West End in 53 attended schools in the West End until 1967. Are your drawings available anywhere? Thanks for your blog. Wish you all the best. Every illustration I created while in the employ of the Westender stayed with the paper when I left in 1983. Kevin McKeown may know something of the whereabouts of the house drawings but it’s possible that they only survived in print. And I am not aware if archive copies of the Westender are available. If I find that copies are available I will let you know. « Here we go with the snow again!